Step 1. Place cake on a cake board or serving platter. Step 2. Use a spatula to spread frosting onto half of each chocolate stick and arrange around the edge of the cake. Place 6 sticks upright as a barn, with 2 more placed horizontally on top to make a roof. Step 3. Cover top of the cake in frosting and smooth out. Step 4. Place coconut in a resealable bag and add green food colouring. Shake and rub bag together to distribute colour. Step 5. Cut a piece of paper into the shape of a path. Gently lay it on the cake and sprinkle the coconut over the uncovered area. Remove the paper. Step 6. Place the fences on the cake for the animals. Add the animals into the pens. I bought this cake at the supermarket. It was a chocolate cake with chocolate icing and sprinkles. 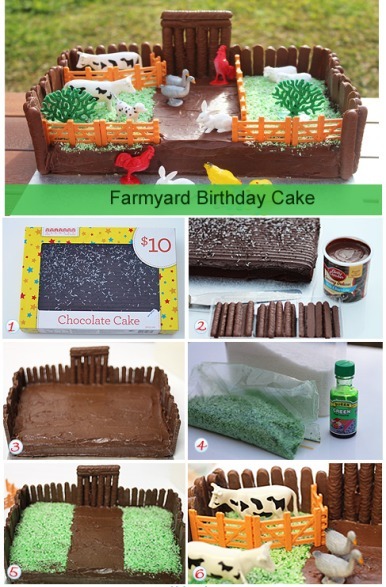 If you want to make a cake from scratch you can make this as a Large birthday mud cake. I purchased the farm toys from Kmart for $15 for 200 pieces. This recipe was created by Jennifer Cheung for Kidspot,New Zealands best recipe finder.